EURO-COOL plate in frame glycol chiller is flooded ammonia design. 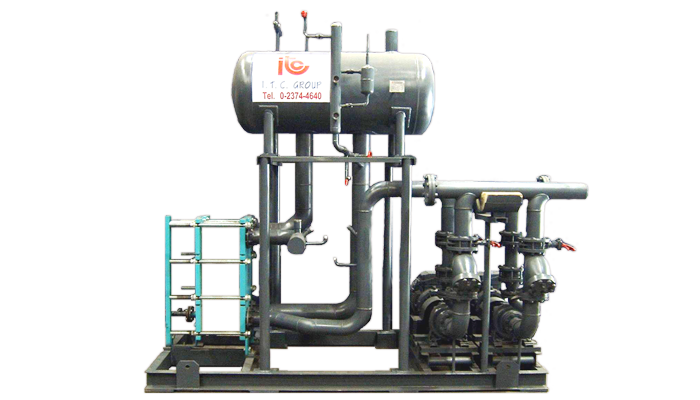 The package complete with a plate heat exchanger, glycol pump(s), a horizontal accumulator with dual relief valves, level indicator column, float switch, and all necessary valves for operation and maintenance. The above package is on a structural steel skid that is piped, tested, painted and shipped as one unit. ITC’s Package Plate Heat Exchanger is a perfect fit for fast heat exchange because of its large surface area and the compact plate‘s alignment. As a result, speedy heat transfer happens. During the heat exchange, only two substances involve: ammonia and water with glycol (antifreeze substance). Both substances will flow through each plate and transfer the heat. Consequently, operating on -5℃ evaporating temperature and water a 3℃ inlet temperature will yield a –2℃ outlet temperature. Furthermore, due to the high tensile strength of SS304 material stainless steel, the plate sheet can last for a longer time. The maximum working pressure of the refrigerant side can also tolerate 16 bar(g) pressure whereas the water side can handle up to 10 bar(g). In addition, an accumulator (ASTM A516 grade 70), end suction pump, 2-4 poles and 380V/3ph/50Hz are included in the package. Thus, ITC offers you a high quality Package Plate Heat exchanger. It is, undisputedly, one of the best heat exchanger ever.